Earlier this year, I learned about Barnraiser.us, whose mission it is to promote sustainable farming by raising and providing funds for farmers and food producers who want to provide sustainable products. When they were helping Carole Morison, a farmer, go free range, I contributed an egg recipe for a promotional collection they were putting together. I thought I’d share it with you. 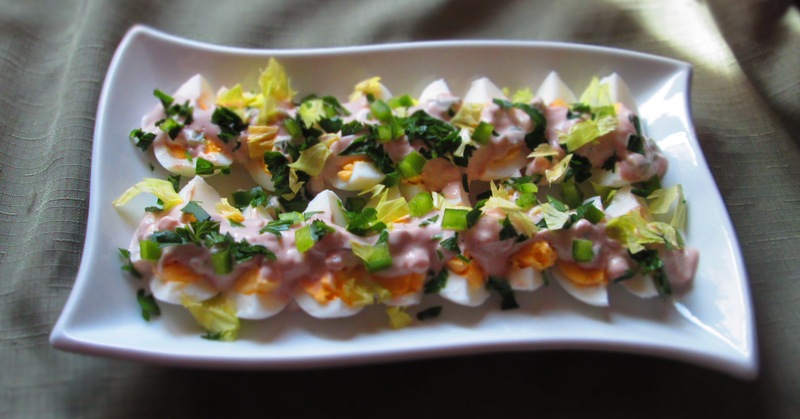 This is a cross between deviled eggs and egg salad. What makes this egg salad special is the dressing, which bursts with flavor, partly from the balsamic vinegar and partly from the mustard, and it’s healthier because rather than using the typical mayonnaise, I used Greek yogurt. Choose a good-quality, flavored mustard—I first tried this with a wonderful bourbon-molasses mustard and it was a huge hit. Also, I suggest using whole-milk yogurt because low- or non-fat yogurt can be tarter and grainier than whole milk yogurt. Try this at your next party, barbecue, or picnic. Enjoy! Place the eggs in a pot big enough to hold them without crowding them. Fill pot with cold water to cover by at least an inch. Add ½ teaspoon salt. Cover and bring to a boil. Turn off the heat, keep the lid on, and let them sit for 10 minutes off heat. Meanwhile, in a medium bowl, whisk together yogurt, balsamic vinegar, shallot, mustard, celery, green pepper, pepper, and remaining salt. Taste and adjust, as needed. Set aside. Drain the eggs and place them in a bowl with cold water. Drain and refill with cold water a couple of times. Gently tap and roll the eggs on a counter or plate to crack the shells then place them back in cold water and let them sit about 15 minutes (this allows the water to seep underneath the shells, making them easier to peel). Peel and rinse to remove all shell remnants. Dry on paper towels. Cut into quarters lengthwise and arrange them neatly on a platter. Place dollops of the dressing over the eggs, spreading it out so that all the eggs are covered. Garnish as desired. Keep chilled until ready to serve. Makes 48 pieces (about 24 servings). 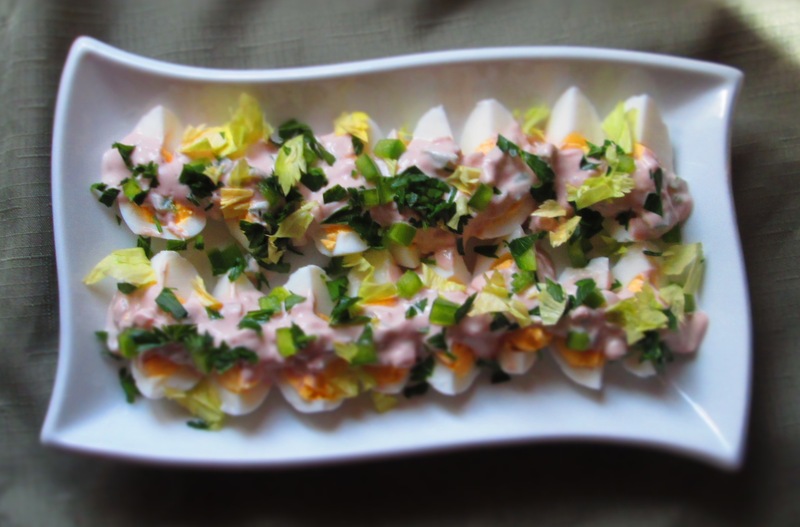 Categories: Appetizers/Hor d'Oeuvres, Gluten-free, Healthy Alternatives, Recipes, Savory Cooking, Vegetarian | Tags: deviled eggs, eggs | Permalink.